The body can be the source of great pleasure and great pain and therefore the root of great attachment and aversion. The Buddha showed it can also be used as a field for the cultivation of wisdom and compassion. Join Jesse for this intensive silent vipassana meditation retreat where we will emphasize an approach toward liberation using a mindful and kind-hearted relationship with the manifold experiences of the body. Training with breath, the 4 elements, and touch-points throughout the body will help develop a profound understanding of the nature of life bolstered by lovingkindness, compassion, joy, and equanimity. 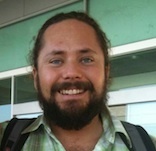 Jesse Maceo Vega-Frey is the resident teacher for Vipassana Hawai’i and teaches around the world. Jesse was a co-founder of The Stone House, a center for spiritual life and social justice in Mebane, NC, and was a board member of the Buddhist Peace Fellowship for several years. Listen to some of his Dhamma talks and meditation instructions here or read a recent article in Turning Wheel, the online magazine of the Buddhist Peace Fellowship, here. For more information about the teachers, click here. The retreat will be hosted by The Sacred Falls International Meditation Center, Hauula, Hawai'i, which offers three different choices for accommodation in a green, natural setting. Options for the retreat are four single rooms, 6 people to a yurt (there are three on-site PLEASE DO NOT TAKE IF YOU SNORE) and options for bringing your own tent. This will be the first-time Sacred Falls will host us. Dana for The Sacred Falls International Meditation Center will be much appreciated. The Laotian based center will be providing our meals. This will only include a light snack for dinner (evening only snacks, like cookies, yogurt, and/or fruits. There may not be a real vegetarian option as the Laotian devotees will be doing the cooking. Usually, there are some vegetarian dishes. No dietary meals can be offered (i.e. no dairy or gluten-free options will be available). If you cancel 14 - 44 days prior to the retreat: We will refund all fees less $100.00.